Buying Property in British Virgin Is. | How To Buy a House in British Virgin Is. How high are realtors´ and lawyers´ fees in British Virgin Islands? What about other property purchase costs? How difficult is the property purchase process in British Virgin Islands? Unless you or your parents were born in the BVI, you will need a "Non-Belonger Land Holding License" (NBLHL) in order to buy property. A NBLHL is only granted in order for you to take title to a specific property. A NBLHL takes 12 to 24 months to obtain. A 10% deposit is paid on a Sale & Purchase Agreement and goes on to a CD until closing. Interest to the seller is customary. If buying an empty lot, you must agree to build within 2 to 3 years with a minimum expenditure of approximately US$250,000. Once agreement in principle has been reached, a legally binding purchase and sale agreement is drawn up by the vendor´s attorney, and signed by the parties. This normally contains a condition that completion is contingent upon the purchaser obtaining a NBLHL. A prospective purchaser normally pays a 10% earnest deposit to the vendor´s agent, to be held in escrow. A purchaser will normally acquire absolute title which is registered in the BVI Government Land Registry. 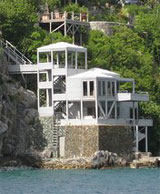 The British Virgin Islands uses the US Dollar (USD). Stamp duty on property transfers depend on the status of the buyer; whether he is considered to be a belonger (national) or non-belonger (foreigner). The tax base is either the sales price or the market value of the property, whichever is higher. All foreigners, including British Citizens, require a Non-Belonger Land Holding License (NBLHL) to buy a property in the BVI. Agreements for property purchases are made conditional to the acquisition of an NBLHL. Applications must be supported by two character references, financial references and police certificate of good standing. The filing fee is US$200 for individuals and US$500 for companies. Approval may take around three to nine months. The fee for the grant of the license is US$600 for an individual and US$1,000 for companies. Legal fees are imposed on the property value at 2% for the first US$100,000 and at 1% for the remaining amount. Legal fee is US$150 at the minimum. There is an additional charge of US300 for the preparation and filing of the NBLHL. Real estate agent commission ranges from 6% to 8%. How high are estate duties in British Virgin Islands?